The Sport + Prevention Center from Raliance offers a vast array of resources to support athletic communities in preventing domestic and sexual violence and promoting social change. The website offers a database of violence prevention resources for members of the sports community, research on the value of using athletics to prevent violence, a learning exchange, and more. As a highly influential system in American society, sport has the power to both contribute to the pervasiveness of sexual and domestic violence, and be part of the solution. The Sport + Prevention Center offers resources to support athletic communities at youth, high school, college, and professional levels in violence prevention efforts. The Prevention Database houses tools to engage each segment of athletic communities: athletes, coaches, families/fans, administrators, and organizations/leagues. Users can also search the database by age group or by strategy type: enforce policy, engage in partnership, build champions, measure impact, etc. 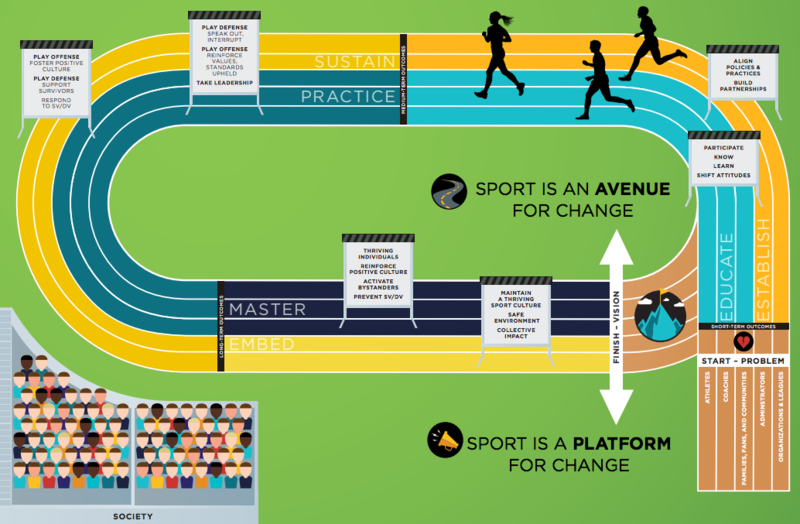 Members of athletic communities can use the interactive roadmap to explore the roles that different members of the community can play in preventing violence, and what strategies they can use. They can also connect with prevention experts and others in the sport community through the the Sport + Prevention Center's Learning Exchange. Access the prevention database, roadmap. and learning exchange on the Prevention + Sport website.